✔ MULTI-FUNCTION: 4-in-1 electric shaver includes a 3-in-1 razor head, precise shaver head, precise trimmer head, facial cleansing brush. This electric hair remover set will meet all your needs, comfortably shaving arms, legs, armpits, faces and intimate areas. Provide you a smooth and fast shaving experience. ✔ FACIAL CLEANSER BRUSH: The facial cleansing brush head can help you remove the residual cosmetics and dirt from your pores.It also does massage treatment to your face muscle and promotes blood circulation of your skin, get a deep, gentle facial cleansing experience. OUR 100% NATURAL INGREDIENTS Including Organic Moroccan Argan Oil and Apricot Oil Make This Beard Oil The Best Quality Beard Product To Date. No Fillers, Fragrances, Additives, Parabens Or Gmo’s. Product Has Not Been Tested On Animals. Vegan Friendly. 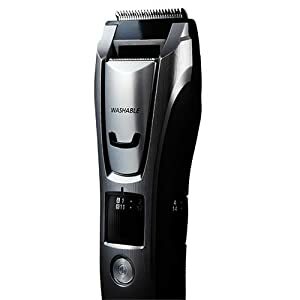 The Panasonic All-In-One electric beard and hair trimmer for men exceeds the highest standards of trimmer and clipper quality, reliability and comfort. With 39 adjustable clipper and trimmer settings and three comb attachments, the ER-GB80-S mens groomer is precision designed to easily maintain your individual look and style at home and on the go. Use the body comb attachment to transform the Panasonic ER-GB80-S into a men’s body groomer; the ‘A’ comb attachment for use as a facial trimmer; the ‘B’ comb attachment is ideal for use as a hair clipper or long beard trimmer. 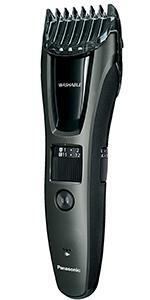 The GB80 mens electric trimmer can be used cordless for up to 54 minutes or, plug in for extended use. 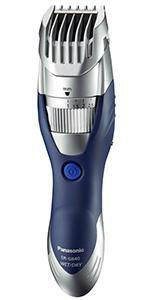 The Panasonic men’s hair and beard trimmer is 100% washable and cleans quickly under running water. 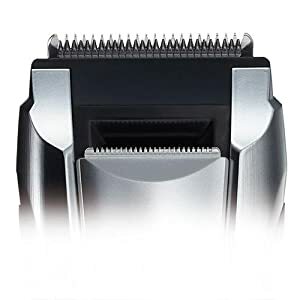 Like all Panasonic wet dry shavers, and beard and hair trimmers for men, the blade should be replaced when dull for the best beard trimmer performance. 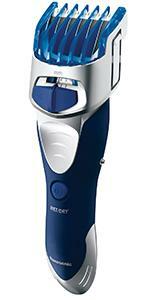 Replacement accessories include the WER9605P trimmer blade. 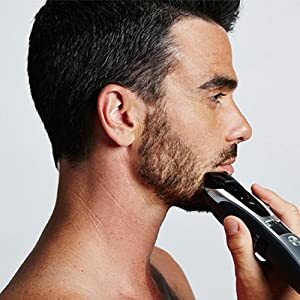 Each of the electric beard trimmer’s ultra-sharp, durable blades designed into this powerful men beard trimmer system are precision-honed to an acute 45° angle for quick and effective beard, hair and mustache maintenance. 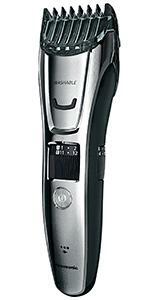 Panasonic’s highest-quality 45° blades cut quickly and cleanly through even the thickest, densest and most unruly hair. 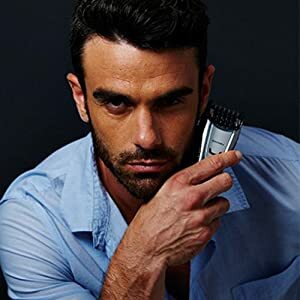 The mens grooming trimmer blades are precision forged from hypo-allergenic stainless steel to ensure safe, non-irritating beard and hair trimming on even the most sensitive skin. 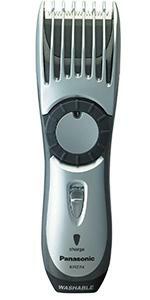 For body hair, Panasonic’s trimmer comb attachments ensure comfort with safe, rounded edges to minimize tugging and pulling while clipping and trimming. With the Panasonic ER-GB80-S trimmer, it’s easy to create and neatly maintain your look and style with the adjustable beard trimmer dial. Smartly located on the rubberized, ergonomic ER-GB80-S handle, this electric hair trimmer for men provides 39 precision trimmer and clipper settings—in 0.5mm increments from 0.5 to 20.0mm—to provide the exact trimmer lengths you want for smooth, precise trimming, clipping, detailing and cutting. 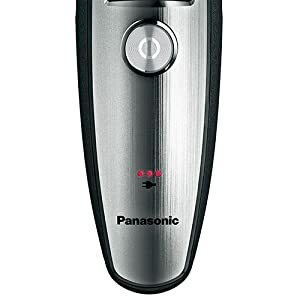 With just your fingertip, you can instantly engage the Panasonic electric beard trimmer’s slide-up trimmer to add the perfect mens grooming edge to sideburns and mustaches or deal instantly with unwanted hair while trimming and cutting. 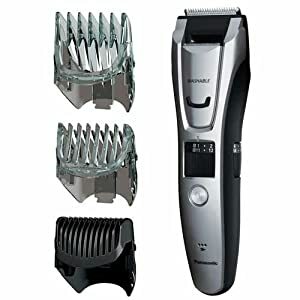 This added grooming accessory to the ER-GB80-S is also equipped with Panasonic’s precision-honed, acute 45° angle blades for clean, comfortable beard and body trimmer performance. Three precision electric trimmer attachments snap quickly and securely onto the Panasonic electric beard and hair trimmer head for clean, confident and exact trimming lengths. Use the A comb (1 to 10mm) hair and beard grooming attachment for closer, cleaner mustache and beard trimming. Or the B hair trimmer comb (11 to 20mm) for a longer, fuller look. For grooming body hair, the 1.5mm attachment gently trims, underarms, chest, shoulders, legs and other areas. 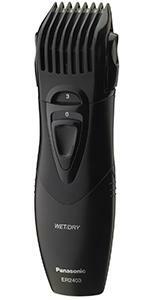 Sleek, lightweight and durable, the Panasonic beard and hair trimmer has an ergonomic mens clipper design and rubberized grip for maximum user comfort, total control, and outstanding cutting and trimming results. 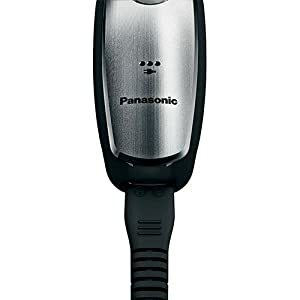 Designed for quality, reliability and convenience anytime, anywhere, the Panasonic GB80-S rechargeable beard trimmer can be operated as a cordless hair clipper or plugged into any AC outlet for longer corded use. 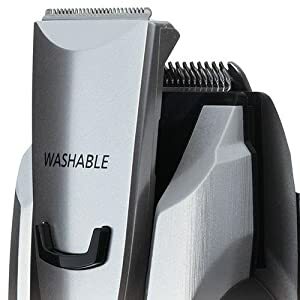 This powerful mens clippers fits conveniently in your grooming kit and features universal voltage, and an AC adapter/charger for hassle-free beard, hair and body grooming when traveling internationally. The rechargeable Ni-MH battery charges your Panasonic men’s grooming trimmer in an hour to provide up to 50 minutes of continuous trimming and cutting power. 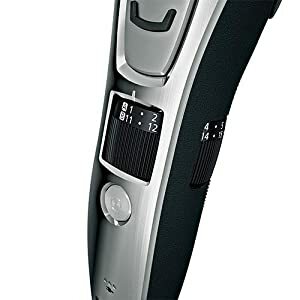 An LED charge indicator on the sure-grip GB80-S handle indicates charging progress and displays the level of available battery power when the electric hair trimmer is used cordlessly. 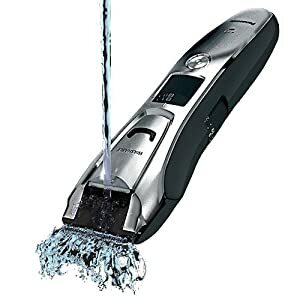 For quick, convenient beard and hair trimmer cleaning in seconds, an easy-open water drain in the mens groomer body allows running water to flow freely through the trimmer and ensure like-new operation for years to come.